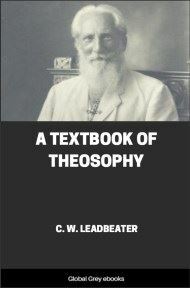 We often speak of Theosophy as not in itself a religion, but the truth which lies behind all religions alike. That is so; yet, from another point of view, we may surely say that it is at once a philosophy, a religion and a science. It is a philosophy, because it puts plainly before us an explanation of the scheme of evolution of both the souls and the bodies contained in our solar system. It is a religion in so far as, having shown us the course of ordinary evolution, it also puts before us and advises a method of shortening that course, so that by conscious effort we may progress more directly towards the goal. Two books already exist which answer that question: Mr. Sinnett's Esoteric Buddhism and Dr. Besant's The Ancient Wisdom. I have no thought of entering into competition with those standard works; what I desire is to present a statement, as clear and simple as I can make it, which may be regarded as introductory to them. As a philosophy, it explains to us that the solar system is a carefully-ordered mechanism, a manifestation of a magnificent life, of which man is but a small part. Nevertheless, it takes up that small part which immediately concerns us, and treats it exhaustively under three heads—present, past and future. It deals with the present by describing what man really is, as seen by means of developed faculties. It is customary to speak of man as having a soul. Theosophy, as the result of direct investigation, reverses that dictum, and states that man is a soul, and has a body—in fact several bodies, which are his vehicles and instruments in various worlds. These worlds are not separate in space; they are simultaneously present with us, here and now, and can be examined; they are the divisions of the material side of Nature—different degrees of density in the aggregation of matter, as will presently be explained in detail. 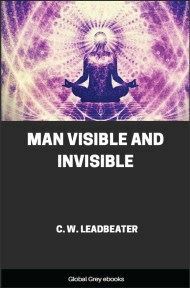 Man has an existence in several of these, but is normally conscious only of the lowest, though sometimes in dreams and trances he has glimpses of some of the others. What is called death is the laying aside of the vehicle belonging to this lowest world, but the soul or real man in a higher world is no more changed or affected by this than the physical man is changed or affected when he removes his overcoat. All this is a matter, not of speculation, but of observation and experiment. 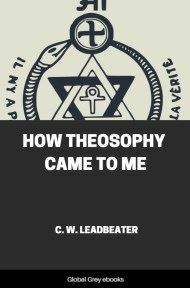 Theosophy has much to tell us of the past history of man—of how in the course of evolution he has come to be what he now is. This also is a matter of observation, because of the fact that there exists an indelible record of all that has taken place—a sort of memory of Nature—by examining which the scenes of earlier evolution may be made to pass before the eyes of the investigator as though they were happening at this moment. By thus studying the past we learn that man is divine in origin and that he has a long evolution behind him—a double evolution, that of the life or soul within, and that of the outer form. We learn, too, that the life of man as a soul is of, what to us seems, enormous length, and that what we have been in the habit of calling his life is in reality only one day of his real existence. He has already lived through many such days, and has many more of them yet before him; and if we wish to understand the real life and its object, we must consider it in relation not only to this one day of it, which begins with birth and ends with death, but also to the days which have gone before and those which are yet to come. Of those that are yet to come there is also much to be said, and on this subject, too, a great deal of definite information is available. Such information is obtainable, first, from men who have already passed much further along the road of evolution than we, and have consequently direct experience of it; and, secondly, from inferences drawn from the obvious direction of the steps which we see to have been previously taken. The goal of this particular cycle is in sight, though still far above us but it would seem that, even when that has been attained, an infinity of progress still lies before everyone who is willing to undertake it. 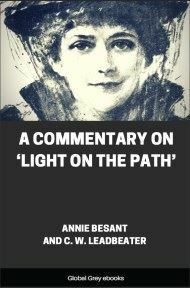 One of the most striking advantages of Theosophy is that the light which it brings to us at once solves many of our problems, clears away many difficulties, accounts for the apparent injustices of life, and in all directions brings order out of seeming chaos. Thus, while some of its teaching is based upon the observation of forces whose direct working is somewhat beyond the ken of the ordinary man of the world, if the latter will accept it as a hypothesis he will very soon come to see that it must be a correct one, because it, and it alone, furnishes a coherent and reasonable explanation of the drama of life which is being played before him.